Get a taste for the heart of Atlanta on a guided Segway PT tour. With a small group, learn to ride the through your guide's instruction and then head out into the city to see highlights, such as Centennial Olympic Park, CNN Headquarters, The Mercedes Benz Stadium, Georgia Aquarium, World of Coke and much more. This activity provides a wonderful overview of Atlanta from past to present. 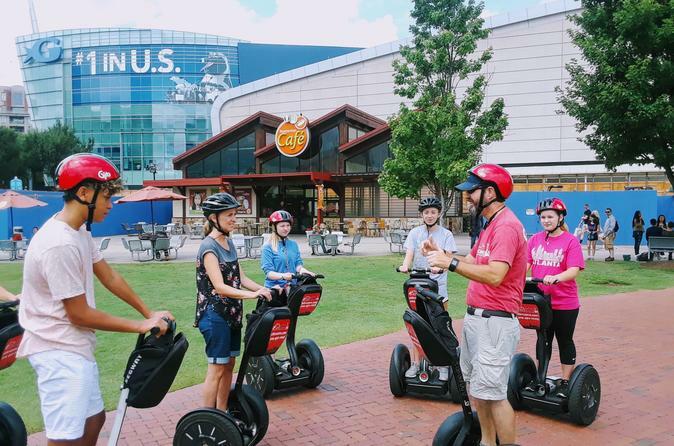 Meet your guide and group at the Segway depot, listen to an orientation, and undergo training on how to operate the 2-wheeled, self-balancing, electric scooter. Once you feel confident, head out into the heart of Atlanta to explore. With your guide in the lead, this fun ride will take you through modern and historic downtown. Starting with a ride through Centennial Olympic Park, you will see the major attractions including The Georgia Aquarium, World of Coke, CNN Headquarters and Center for Civil & Human Rights Museum. The tour will end with a glide through old Downtown highlighting historical architecture from the late 1800's.